What with the recent explosion of attention towards a certain tearjerker of a book/movie, I've thought a lot recently about the emotional interfacing between a reader and a book. A good book (or story of any kind, really) makes a reader feel something—it connects with the reader on some critical level. A good book, at the risk of preaching to the choir, takes a person through a range of emotions and experiences perhaps otherwise unknown to them—so joy from the book is uplifting, sorrow from the book is cathartic, and so on. So, having established that my tear ducts are, in fact, filled with cement, I'm terribly curious to hear from others. Are you inclined to cry with books (comics/movies/whatever)? If so, which ones affected you the most? Do you prefer crying over what's very personal to you, or will a more general tale of woe move you just as much? Leave your wisdom in the comments! I'd love to hear your thoughts. I am told that, out there in the world, there are people who are able to immaculately balance their work and pleasure, their day job and their hobbies. These people can maintain an internet presence whilst dealing with everything going on in the real world—impressively navigating both halves of their lives, and doing so in an entertaining fashion as well. In the weeks following my graduation (yay! I have my degree/survived my thesis/etc.! ), I've realized just how terrible I really am at balancing my life. I had an inkling before, of course—I've never been one for "balance" in any area, but I've survived. My habit of throwing myself, heart and soul, into a project came back to haunt me. Don't mistake me: this year was good for me, academically. I really did enjoy working on my thesis—it was a stimulating and truly fascinating project, and one that I hope to continue in my graduate program. But, in retrospect, I see that my approach to my academic career was unhealthily intense—it made my academic writing process inefficient, and (as a result) it consumed time that I could have spent working on my WIPs, or hiking, or chatting with friends, or, you know—doing other things that people normally do, because they have lives and the ability to balance their work in a healthy fashion. I wish I knew why I fall into this trap—the horrifically intense focus on ONE thing (in this case, academics) to the exclusion of almost everything else, the burnout resulting from it, and so on. With my graduate studies looming on the horizon, I'm especially hopeful that I will find a way to maximize efficiency in my studies, and so find a way to maintain writing fiction and, y'know, otherwise live. That said, if anyone happens to know The Secret to maintaining a social media presence and balancing an academic career with other bookish pursuits, I would love to know. It could make my next two years much easier. So, how do you win one of these fantastic devices? Spread the word. For full details, take a hop over to Victoria's blog, and remember that nothing is lost. There's nothing quite like a good villain. Since the earliest days of storytelling, one of the most common ways of expressing a conflict (or, more broadly, telling a tale) has been cast through one person against another person—the basic building-blocks from which we draw our hero and our villain, to be sure. Yet perspective accounts for perhaps more than we would like, and the hero of one story is often the villain of another. What is it about villains that continues to compel and impress us even as we reel from their actions? What twists and turns of psychology wedded to narrative are responsible for our long-lasting attachment to the figures who, by all rights, ought to repel us? Let's take a look. First, a note about terminology. As I am primarily concerned with tales of the fantastic, I usually default to talk of heroes and villains, but it seems to me that the same principle applies with protagonists and antagonists. At any rate, when you reduce them—protagonists, antagonists, heroes, villains—to their base substance, break their psychologies apart and poke about with all their bits and pieces, they're all people in the end. The most basic conception of a hero and a villain—in other words, the one people will most typically use as a default—is, in many ways, one of the newest. The Iliad shows us snippets of one of the most famous wars in literature, and yet it treats both sides with astonishing clarity and a kind of sensitivity to perspective that might surprise some; the kinds of things that Greek tragic heroes do would cause most normal people to recoil. This absence of black-and-white heroism and villainy continues in Beowulf, where—much to the dismay of many a student misled by a poor translation—Grendel and company are viewed as fierce combatants worthy of a fair fight, rather than purely monstrous beasts. This inclination to flesh out the villains—where the villains are the opponents, the worthy foe, rather than the zombie slowly lumbering through the hallway—is likely rooted in an understanding of the way in which heroes and villains are complementary. It seems to me that a hero is only as good as their villain, because they represent two differing aspects (or perspectives) of the same story. This duality of perspective is further emphasized if the hero and villain literally share character traits and a backstory, of course, but it need not be essential to the hero/villain dynamic. I would argue that our attachment to villains, though, is also rooted in an awareness of human interaction as well. We can well acknowledge that heroes and villains have interchangeable roles insofar as they represent two halves of a whole story. A shift of perspective is all it takes for us to realize that the villain sees himself or herself as the hero of the story, because even the most abhorrent of individuals can have convictions, resolutions, hope. This perspective-shift, ultimately, is simple enough. The problem is that we're always the heroes of our own stories, and so we become blind to it. When we're the villain of someone else's story, though—that's when we're conscious of our role, when we know the kind of story we've wandered into. We are always more conscious of our role within a story, even if it's the story of a life, when it's someone else's. This hyperawareness of how we stand in opposition gives us greater understanding on an emotional level of a villain, even if we would never condone that villain's actions. We forget when we're the hero, but we forever remember when we're the villain. Beyond our instinctual understanding of villains and why they do what they do, however, villains provide us with the opportunity to explore a number of situations and possible realities through the filter of everything that drew us to such a villain in the first place. They allow us to comprehend the emotions and situations that would create such a person while remaining distant enough to not, for one moment, condone their actions. Villains, and the dual balancing act they create with other characters, cause us an exercise in compassion and stimulate our intellect by trying to puzzle out how they work—yet, in doing so, we are redirected to puzzle over ourselves in an attempt to understand not simply how that character acted, but how we might have acted, and how any given human might respond to such circumstances. The semi-standard tragic backstory now provided for a number of villains is a vehicle to facilitate this examination, certainly, but it can serve as a worthwhile exercise—even if subconscious—with less sympathetic characters as well. So, guys—you know that The Archived has a sequel, right? The Unbound comes out 1.28.14. Right in the middle of my thesis. ...I'm taking January 28 off writing my thesis for this book. Well. Um. It HAS been a while, hasn't it? In essence, what happened was this: I realized that I am a full-time student, and although I DID manage to finish a very short, skimpy WIP which is now in the loving hands of my CP, that meant that my priorities lay with my academic work...including study abroad issues, lots of paperwork, passports, thesis issues and applications for funding. In short, lots of paperwork, little time for writing, let alone blogging...yes, my friends, I fail. I fail spectacularly. But I am currently on spring break, and this means that I have a wee bit of time to update Das Blog. Granted, it also means that I have time to work on filing papers 120492349a through 15909302c, but still. In addition to finishing the very, very messy first draft of BB and preparing to draft my thesis prospectus, I was accepted into an incredible program a few weeks ago that will take me to Rome—yes, the eternal city and all that—for almost two months this summer. I'm very eager to attend, of course, but alas—several conference submissions, a thesis prospectus, a mile-high stack of papers and final exams stand in my way. Soon, my pretties. Soon. This means, though, that I will be chronicling my escapades in Rome here—on the blog. You will, no doubt, receive copious pictures of various Roman artifacts, along with me posing rather irreverently alongside. Via the blog, I shall stay connected to the rest of the world, rather than being sucked wholly into the distant past. I anticipate an awful lot of running. In the meanwhile, however, I'm going to attempt to keep blogging about various and sundry things that might be of mild interest. I'm still gathering participants for my ARCHIVED project, so if you're interested, see the post right below and drop me a line. But, before I plunge back into my academic duties, I'd love to hear from you, dear readers—is there anything specific you'd like a post on? It can be anything, really. You can tell me to pick something from my WIPs with which to embarrass myself, or you can ask for pictures about how on earth am I going to pack for two months in a carry-on, or you can request that I blog about that time I met Jack the Ripper and singlehandedly saved the country from a set of bread-wielding terrorists*. Or I could simply post Doctor Who clips. That's always an option. Do you want to be archived? In Victoria Schwab's gorgeous new book The Archived, Mackenzie Bishop hunts down the escaped Histories of the dead in her role as a Keeper of the Archive. In the Archive, Mac is surrounded by the catalogued dead—every detail of their lives captured and stored within its walls. And in my new project, nicknamed Archive Assemble on Twitter, we can do something similar. Not with our memories, of course, but with our names. I have two copies of The Archived. One is mine, and the other—I hope—is not just mine, but yours as well. The plan is simple. One person takes the book, writes their name, location, and the date they read/received it inside (if you already own a copy, which I highlyhighlyhighly recommend, then you can still sign up—it's a traveling book, after all! ), and then sends it on to the next person on a master list. The goal is to functionally transform the inner pages of The Archived into a kind of archive in its own right—one recording the path that book traveled to reach a set of readers. Perhaps its pages can't soak up the memories and experiences of the readers, but names? We can do that. The only "catch" is that you have to be comfortable sending me your addresses, so that I can forward them on to whoever is in queue before you. None of your information will ever be used for any purposes other than this project, so you don't have to worry about security. 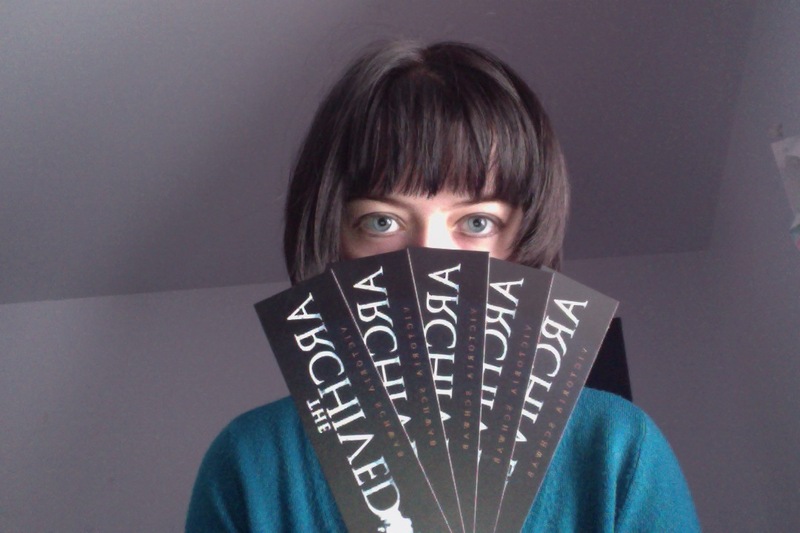 Additionally, in honor of The Archived, I'm giving away five signed bookmarks! Only requirement is that you tell someone—a bookseller, a friend, a librarian—about TA. You don't need to record your conversation in a creepy way or anything—I'll take your word for it. Enter here! As you may know if you follow me on Twitter, today marks the end of my very first week back at Uni. I can't say that it was an easy first week back, but it was a pleasant one overall. All of my classes are on really fascinating topics, and my academic!brain is excited at the prospect of finally hammering out my thesis topic and, with a little luck, getting a head start on what just might be my key into the world of grad school (but ssh—don't tell. I'm still trying to convince myself that I'm sixteen). When I started the semester five days ago, I had nineteen credits. I thought it would be all right, that I could do it, but two courses within those nineteen credits require extensive out-of-class research, and three others were languages (Latin and Greek, both part of my major, and German simply because I love it). No big deal, I supposed—I also had extensive research last semester and three languages. Last semester nearly killed me. I would walk into my courses exhausted, barely able to pay attention, and it was only through a mixture of a near-suicidal rush headlong into exams and coming ever-closer to a mental breakdown that I survived the semester with my grades (though not pride) intact. I survived it, yeah. On the outside, I actually did very well. Did I mention that I was constantly exhausted and flirting with insanity? On top of that, though, I'm also a literary intern, not to mention my own writing, and both of those things were sadly neglected last semester just because I was trying so hard to maintain my grades (and I will confess that, in no uncertain terms, grades = pride. It's no secret that I tie my sense of self-worth to how well I do in my courses, and no, it's not healthy in the least, but I'm working on it. )—and had nothing else in the process. So, yes. This week was exhausting, but manageable. If I ignored my internship, my writing, and all the extra research I needed to do for my classes. Not to mention little things like, oh...my health. So it hurts, but I'm dropping German. It's the only course that is really 'optional', and the only one which I can afford to drop—but I love German. A lot. Languages are like dessert for my brain, and the fact that this one has to be the victim of my overcommitment is painful. The good news is that this should give me time to do things like sleep and eat (...you think I jest. I do not. ), and actually do good research towards my thesis and read for my internship and work on my WIPs. I don't want to abandon German by any means—I'll simply have to pick it up again next year. So, dear readers, this is my pledge to you: through this blog post, which is seriesish (because I'm narcissistic enough to suppose you want to hear allllll about my Uni adventures! /sarcasm), I will achieve balance between my academics and the rest of my life. What I did not expect was that this week would be so useful for my writing. Before the semester started, I was in a huge writing funk—I hadn't written anything for weeks, and I was beginning to consider the horrifying possibility that maybe I had wasted those 28k and this project wouldn't go anywhere. Then a funny thing happened. I was caught between classes on syllabus day with hours to pass sans homework. I was bored. But I had time, and there are few inspirations so powerful as that. And in those stolen moments between classes, I wrote. I didn't write much, for me, but they were words and looked word-like on the document and they made some kind of sense. There were so few of them and a couple were horrific typos and sometimes the subject and verb didn't agree because I'm so tired please can I go to bed yet oh this desk looks comfortable and ow it's actually really hard and OH HEY WORDS, but they were mine, and they were enough that I understood the fundamentals of that story again. It might be trying to kill my soul, that story—but it's my story, and it's written for me, and I love it even if no one ever sees it. It's worth writing—even if I have to steal my seconds and minutes to bring it to fruition. And we'll see how it goes on. This is, I fear, not a review. It is not-a-review because I don't review books. Rather to my own chagrin, in fact, as I woul love o receive beautiful ARCs in the mail and get to read things before my friends so that I can taunt them mercilessly about knowing things, but I'm simply not a book blogger. I'm an archetype-and-whimsy blogger who likes to write wistful, long paragraphs about her own ideas until even I'm sick of them. Hence, I will repeat that this is not a "review". This is a post informing everyone that if you don't read The Archived of your own free will, I will personally hunt you down and hold the book to your face until you read it. Alternatively, I'll just sit here and look betrayed until you give in and read it. The Archived is a truly remarkable book. It's a thriller, built out of high wires and taut strings, but with the kind of thoughtfulness and reflection woven into the mythology of the world that it's every bit as rich and detailed and mysterious as a fairy-tale—equal parts dreams and dark, the sort of story that makes you think and feel and understand things about yourself all at once. It's quite a different book from The Near Witch (which I also loved), and that extends to the writing style, but the same remarkable poetic phrasing that first distinguished TNW as something delicious, fresh and familiar all at once is present in TA's well. The words fit together with such beauty and rightness, each one chosen with the utmost painstaking care imaginable. The scenes were balanced with crisp lyricism and cinematic intensity, and I truly couldn't put it down. The Archived is, simply, brilliant—from the raw, gorgeous mechanics of the story to its heart and soul, it is an unforgettable read. Go forth. Buy The Archived. I'll wait here. Oi, I'm not dead yet! Hello, beautiful internet people! I trust that you all are splendid and magnificent on this fine morning/afternoon/evening/whatever it is when you read this. This is me, popping in to say that I'm actually still alive, and have just managed to crawl away from the semester/first week of catatonic recovery. Aside from my relative internet silence, however, the semester went splendidly (if busily). It was really really ard to balance my writing and my academics. My academic courses required a lot of work on their own, but adding in my neurotic tendencies and seeming obligation to work on things long before they're due, it was a very intense semester. I only managed to write anything substantial (that is, over a random 200 words written from week to week) towards the eleventh week or so, when things finally began to slow down. As a result, I'm only 25k into Blood Brothers (which I'd hoped to finish by Christmas...), and I go back to school in about two weeks. Sigh. But make no mistake, my dear people of the interwebz—I'm not gone. I'm going to post more before I go back, and—if I can manage—establish a post-per-couple-days routine during the semester. With some luck, I'll also have time to work on my WIPs, at least a little bit. Hello, world! I am Rachel at Arms, a moniker I picked up while serving as Sergeant-At-Arms for my honors society. I then became secretary, then President, but somehow "Rachel at Transcribing/Officiating" didn't have the same ring to it. If you have questions, comments, concerns, or really anything to say, you can reach me at nirnaeth7 at gmail!